#4149123 Any info on Video Technology Laser 500 computer? We have the real charset ROM dump! Tonino Bisazza extracted it from a Laser 500 he was repairing. We discovered there are two additional charsets, GERMAN and FRENCH with their relative special letters. 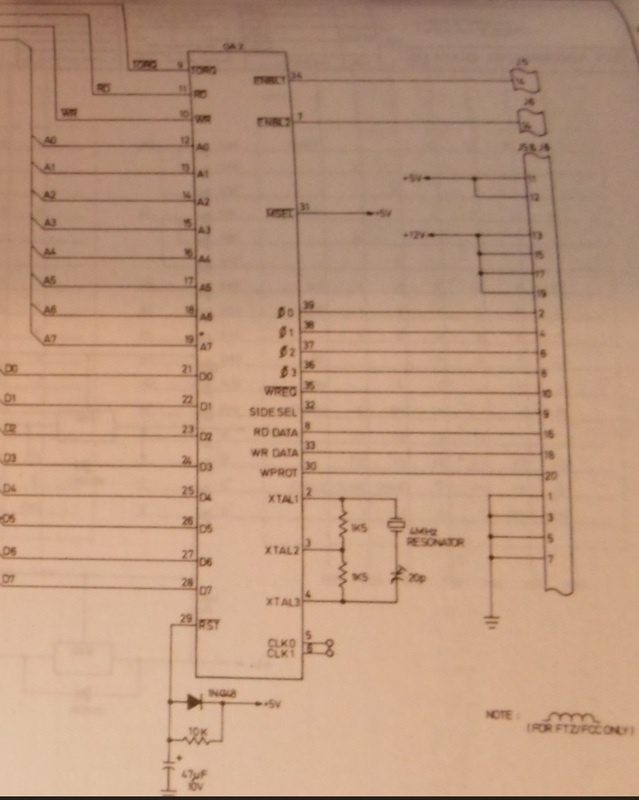 Apparently the choice of the charset is hardwired (see the circuit diagram lines CGA11 and CGA12) but there is also a pin named GT (graphic table?) coming out the video chip that is involved in the selection of the set (I don't understand how though). I wonder whether there is an undocumented feature that is able to switch the charset via software. #4145856 Any info on Video Technology Laser 500 computer? @Bonstra the manual has the pinout for the Laser 700 builtin interface, see the attached file. BTW, how did you connect the laser to the Apple ][ drive? And, I hadn't noticed there were different version of the DOS!! What a surprise! I will look forward for you reverse engineering work so I can integrate it in the emulator and possibly build an hardware interface (@Piero Andreini is working on that but we are stuck replicating the controller's Toshiba gate array chip). Btw, have you figured out what is the rotation speed of the disks? Is it the same as Apple? I would like to emulate the physical rotation because at the present moment the sectors are all "packed" at the start of the track without the spacing in between that comes from rotation. #4139643 Any info on Video Technology Laser 500 computer? Disk emulation is working ! (buggy, but working). Many thanks to @Bonstra who did an awesome reverse engineering work (I'm really impressed) and to @deepfb who saved the VT-DOS disks from oblivion. Thanks guys! Still I can't read the old disks for some reason, but I can format new ones. Saving and loading seem to work nicely as well. A big help came from the SDISKII project (http://tulip-house.d...K2/english.html), the author published the sources to encode a disk into the Apple II format, so I modified it for the Laser (40 tracks, different interleaving) and converted the .dsk disk images that @deepfb has recovered. #4137390 Any info on Video Technology Laser 500 computer? in this video you can clearly see what I was telling some posts ago: text is printed SLOWLY while in graphic mode because they used a set of DRAW commands that were previously manually encoded. This because the charset was not available -- it was not stored in the ROM (as in commodores) but in the video chip directly. So we had this basic subroutine we GOSUBed when we needed to print text in graphic modes. That's just one of the oddities of the Laser computer family. I quote myself... in 2014 I mentioned the infamous DRAW routine used in games to display text. It's taken from the demonstration game "CITY INVASION" (soon to be published). Attached is the version you can run on the emulator or dump to WAV. #4137207 Any info on Video Technology Laser 500 computer? @deepfb a system disk is a disk where the first 22 sectors contains the boot sector + DOS (which are loaded in RAM at boot). You can get them from disk #4. I also think you need an empty directory which is a sector placed at $02900 (see attached image). If we knew the disk interface protocol we could emulate it and attempt a warm boot. And then issue the INIT command. #4133962 Any info on Video Technology Laser 500 computer? 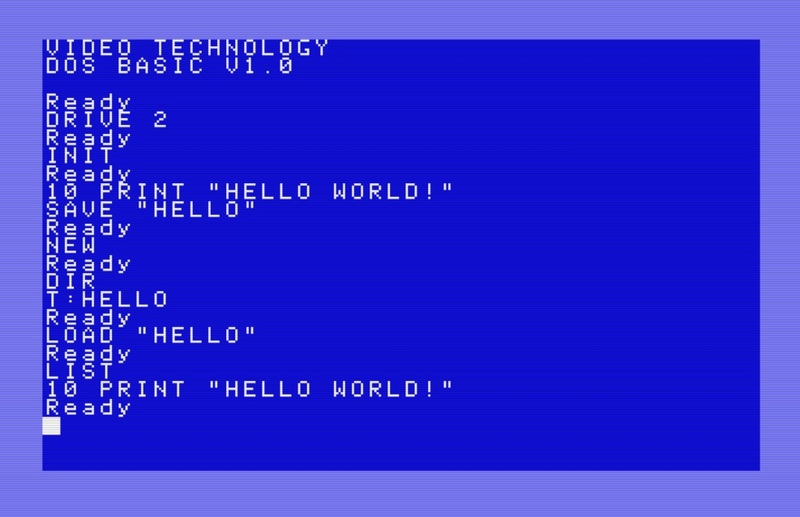 I managed to extract the VT-DOS aka DOS BASIC 1.0 from your disk images. It's only 5.6 Kbytes and it's replicated in almost all disks. I've also disassembled the boot loader routine, it simply reads the first 22 sectors from the disk and places them in memory in page 6 (the 16K Ram that are not available to Basic). @Bonstra do you need any of these for your work on the disk interface? I'm also recovering the software from the other disks but many are corrupted. Soon I will post a report of what I managed to recover. #4116508 Any info on Video Technology Laser 500 computer? The reset key is not like any other key in Laser 500, instead of being part of the keyboard matrix, it is directly connected to the CPU reset pin (hence the name "reset"). That's why the key is able to bring the user back to the "Ready" prompt in almost any situation. It gets out of any loop the CPU is stucked by simply resetting it. 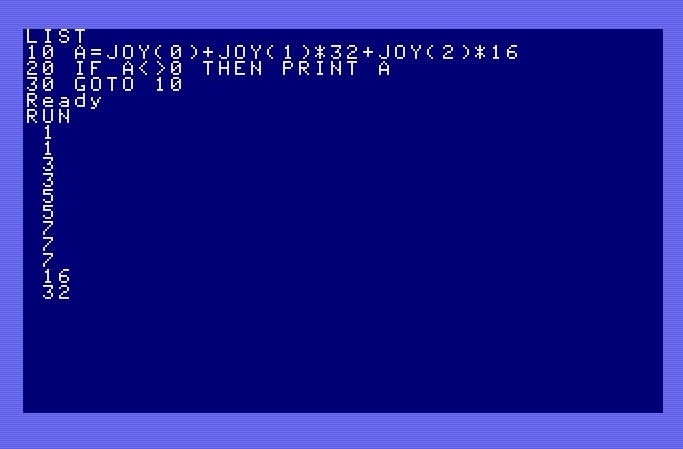 Resetting the Z80 means the CPU clears all its internal registers and begins to execute instructions from location $0000 (in the ROM address space). That's what happens also when you turn on the computer. But yet pressing the "reset" key does not initializes the machine, the BASIC program is not erased, only the prompt is brought back. How is that? The ROM kernel has a trick for knowing whether it's a warm boot or a cold one. When initializing, it checks the 16-bit pointer contained in RAM at $861D, which should contain the "warm reset" routine. If the bytes from this pointer added together plus the constant $E1 matches the content of $861F then it's warm reset, and the CPU continues just from $861D. Otherwise, it's assumed the bytes in the pointer are just uninitialized RAM random values and thus it's a "cold" start. The constant $E1 is added in the sum to avoid zero values of a uninitialized RAM give a false match. reset will be a "warm" one. Normally the pointer is initialized with the value $66C8 which is the actual warm reset routine in the ROM. change any of these, press "reset" and the machine will do a cold start. #4113317 Any info on Video Technology Laser 500 computer? another little discovery: from a picture of a Laser 770 (link below) it can be seen that such machine has no expansion slot; in its place there are the two disk drive connectors. The missing expansion slot means it cannot load external ROMs implying the DOS ROM must be onboard. So the ROM labeled "VTL 27-0401-00-00 // 6133-7081 // 8611MAK" in MESS/MAME is wrong, the label is from Laser 700 but the dumped content is from Laser 350/500. #4111925 Any info on Video Technology Laser 500 computer? 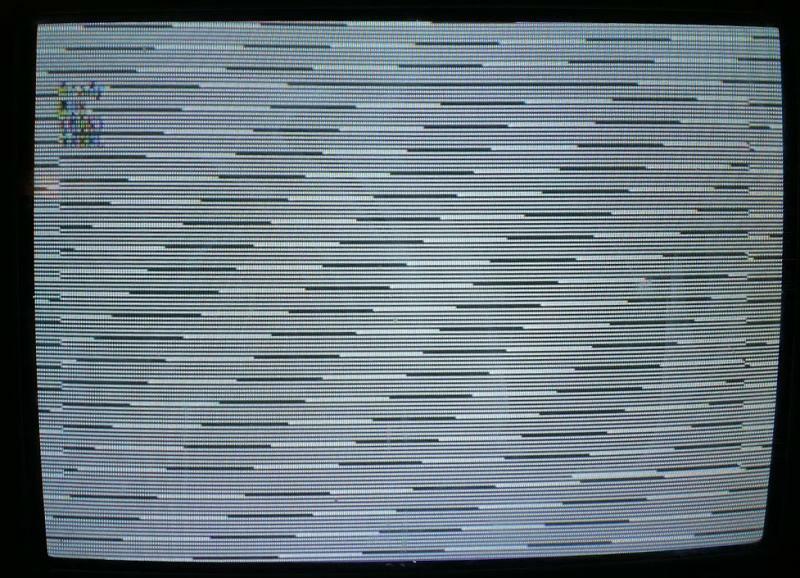 In order to get precise timings for my emulator, I hooked the interrupt vector and used the raster line as a reference. The idea was to change the screen colors, perform delay loops see where the raster is tracing. I did that first on the real hardware and then on the emulator, adjusting the timings accordingly. - the visible text area (24 character rows) is not centered vertically, it is one row up (5 chars above, 7 chars below). Now here is where my calculations do fail: 190 cycles x (576/2) x 50 Hz = 2736000 = ~ 2.7 Mhz which is much below the 3.6 Mhz of the theoretical CPU speed. Where is the missing Megahertz? And I am pretty sure of the timings because the emulator speed matches precisely the real hardware. Perhaps it's the time spent fetching/decoding the instruction? Or am I missing something else? In the picture below, I change color to yellow at the start of the NMI interrupt, then wait a bit and change to red/gray. This is how I measured the time elapsed in drawing the screen. 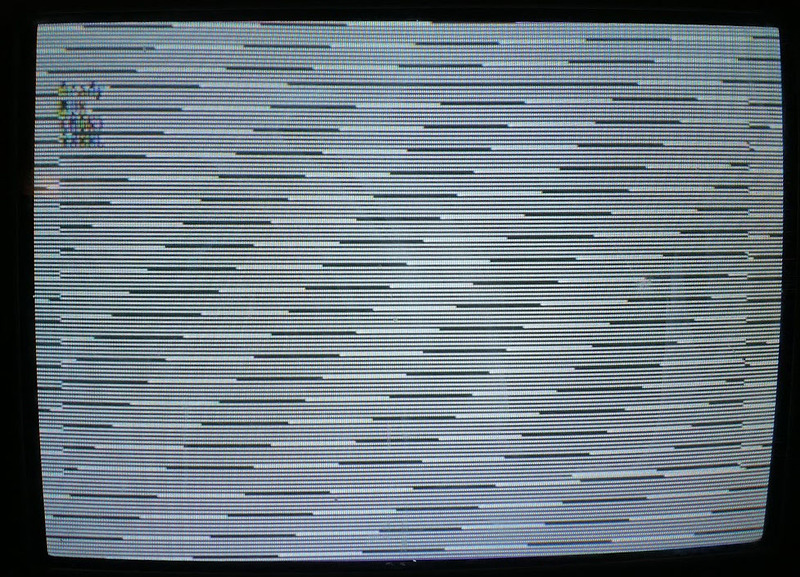 On a separate measure I tried to wait to the last scanlines to assess where the frame ends. Since the CPU is locked in the delay, the cursor became very laggy and unresponsive. Waiting too much caused the interrupt routine to skip a beat and show flashing colors. #4111676 Any info on Video Technology Laser 500 computer? @carlsson, yes the joysticks were the JS20 in the picture, they attached to the expansion slot (not memory expansion). If I remember well it is the same port we attached the printer, the plotter and the light pen. I think it is connected directly to the I/O ports of the Z80. @Bonstra ok for the keyboard, thanks, I got it working now... it was the most difficult part. It responds only to 6800-6fff (when mapped in bank 2) not to just any address in the 16K space. I also believe they added the extra lines when they decided to move from 350 to 500. Indeed the 350 is a 500 in a 310 case which does not have "extended" keys. The ROM is able to detect which machine is running depending on the availability of bank 3. If bank 3 is found then Laser 350 is assumed and the "KEY n" basic command is disabled. The emulator is almost finished, I only have to fix minor details (exact timings etc). It's very handy when doing cross development, it's much more quick and accurate than MAME. #4110818 Any info on Video Technology Laser 500 computer? #4108514 Any info on Video Technology Laser 500 computer? @Bonstra if possible, can you please post any info regarding the keyboard ? I'm having troubles understanding how it works precisely. Intuitively it should be like in Laser200, e.g. 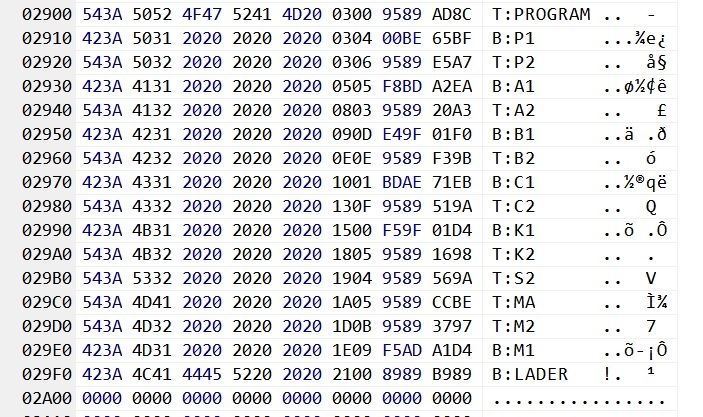 keys mapped in I/O space, columns on the data bus (6 bits) and rows in the address bus (11 bits), with negative logic ("0" means key pressed). But I'm unable to read keys from row > 9 for some reason. Perhaps it's the same reason why they don't get them right in MESS emulator too (and hopefully we can fix that). #4104820 Any info on Video Technology Laser 500 computer? 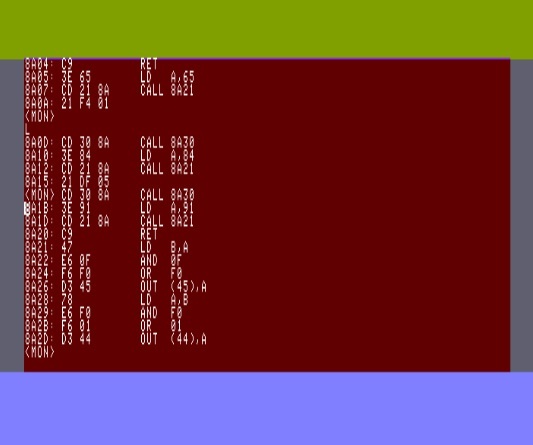 regarding the contended memory between CPU and VDC, I ran a small experiment: a loop writing "A" into the first screen cell and then alternating screen colour at each iteration (see the attached pic). Since there is no significant difference between background and border, I deduce the impact of memory contending in Laser 500 is minimal or non-existent. The same loop, but writing outside of the video memory didn't change anything. Do you have any theories how they made it? #4103463 Any info on Video Technology Laser 500 computer? I figured out how to read and write from and to I/O. 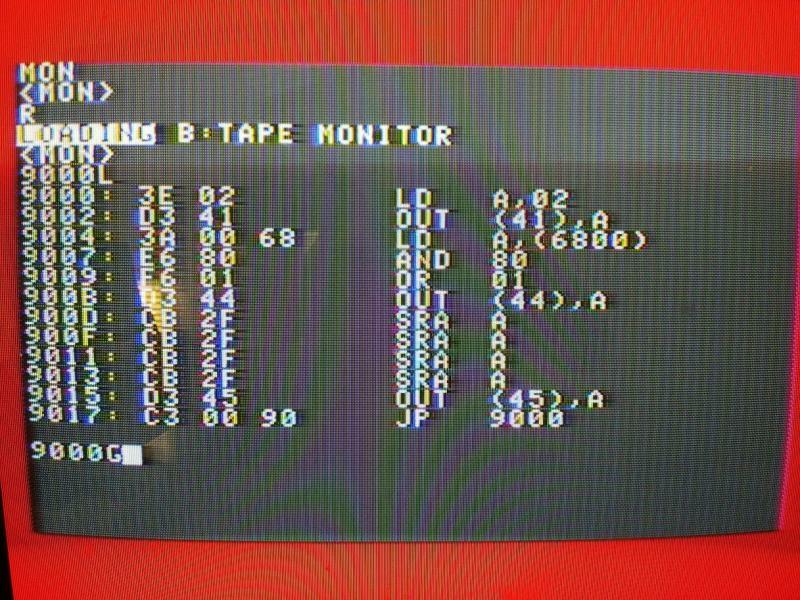 As an example, here is the small program "TAPE MONITOR". It reads the cassette bit and changes the screen color accordingly. 9002 reads the bit 7 of cell 6800h, where the I/O is mapped. Bit 7 is tape. #4103418 Any info on Video Technology Laser 500 computer? @CatPix does the manual contains something about the I/O (speaker/cassette/keyboard) ? In case would you please post a pic of the page?